Almost. Key word being almost. With one taste, you’ll forget about how pretty it is and let your fork destroy the creamy filling and cookie crust. I think it will forgive you. I might not? FIVE ingredients. Can you even believe this?! Is this real life? I had no intention of creating a five ingredient dessert. In fact, when I set out to do things like that, I immediately feel incredibly limited and deprived and end up making a 67 ingredient dessert. You’ve witnessed this. I’m sure of it. and strawberries cut into roses. Eeeep! Now don’t get me wrong, you also need a the patience of a 97-year old mother of ten to cut these strawberries into roses, but it isn’t THAT difficult. Plus, with only five ingredients, it’s worth it! 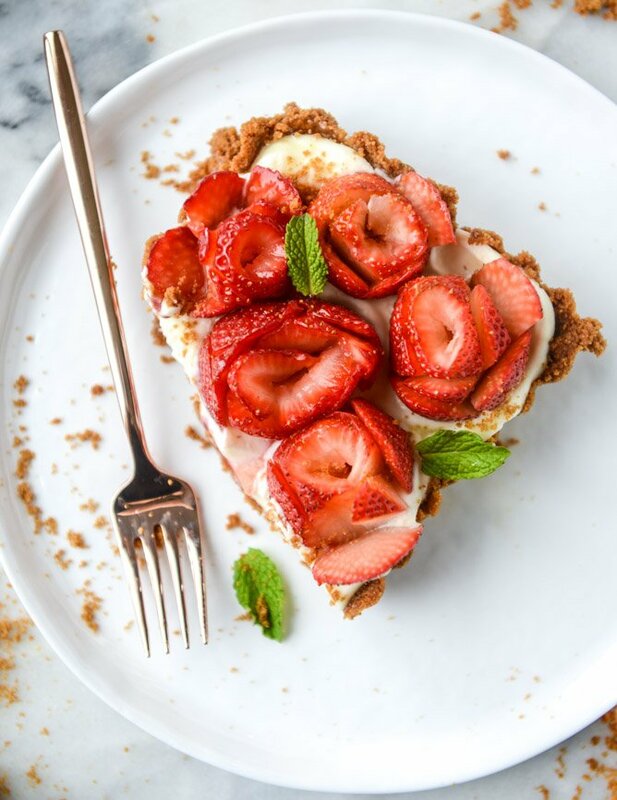 If you want to add a leeeeettle something else, you can spritz your mascarpone filling with lemon and vanilla, drizzle your strawberries with honey and cover the entire thing in mint, but none of those things are necessary for this to taste fabulous. Okay, the cutting of the strawberries. Here is my big secret: google it. That’s all I did. We watched a few videos on how to do it and didn’t even need to practice on that many berries. This one and this one helped the most. For this particular tart, after the rose was carved out, we sliced or pulled off the strawberry tops and set them right on the tart. Simple heaven. The best kind of heaven. Now another big secret… wait for it… you don’t HAVE to cut the strawberries all fancy. They don’t need to be strawberry roses or strawberry tulips or strawberry whatever, they can just be STRAWBERRIES. 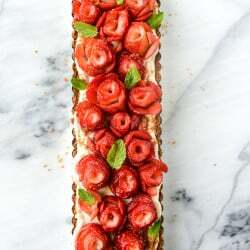 If this flavor combo tugs on your heartstrings but the thought of carving a berry into a plant makes you want to crawl into a hole and die, the tart will still taste as wonderful with sliced strawberries. And maybe even frozen strawberries, thawed. WELL. You know that I’m a slave to graham cracker crusts and that I eat some pie and cheesecake just for the crust alone. And sometimes I eat only the crust, because I’m a freak. But! In this case? I used Biscoff cookies. I just felt like it. Thought it would add some lovely flavor and it did. Graham crumbs will work just as well – so would oreos! I need to make that happen ASAP. You can even change up the fruit. So basically, this is a base tart recipe for whatever flavors your little heart desires. Even better news: this recipe does double duty this weekend, much like the sangria from yesterday. It can totally be you’re dessert at your Kentucky Derby party (helllllo run for the roses!) and is easy enough to whip up sunday morning first thing for Mother’s Day. I’m hopeful that Eddie can throw it together so I can eat it again. YES. To make the crust, stir together the cookie crumbs and melted butter until combined and all the crumbs are moistened. Press the crust into a 4 x 14 inch tart pan, pressing it up along the sides until packed. This will also work in an 8-inch round tart pan. Stir together the mascarpone and sugar until creamy and combined. If you have lemon juice or vanilla extract on hand, add a splash. Spread the mascarpone on the graham crust evenly. Refrigerate for at least 1 hour. While the tart is in the fridge, cut the strawberries. I used this tutorial to cut them into roses. 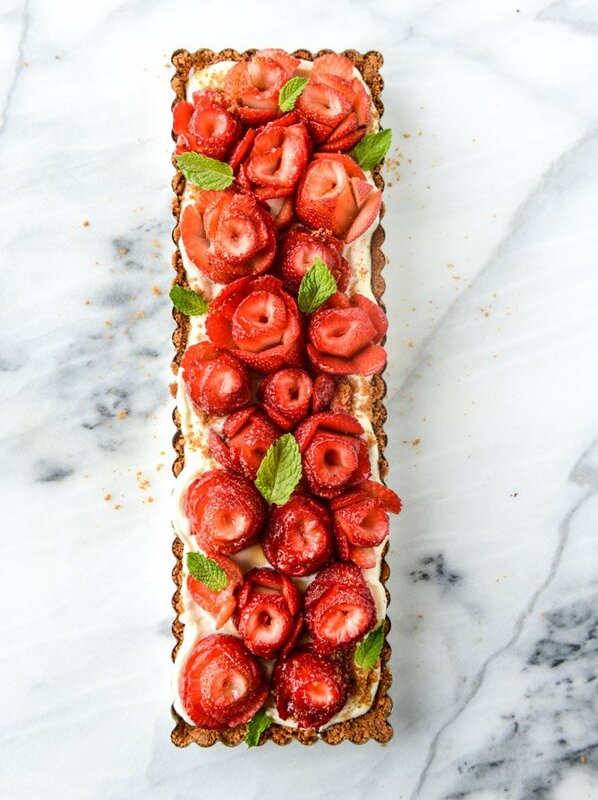 Right before serving, place the strawberries on the mascarpone tart. 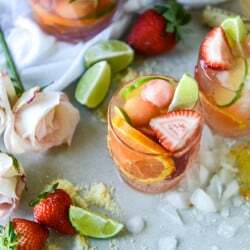 If desired, you can drizzle the strawberries with honey or add a few fresh mint leaves for garnish. You can serve immediately, or keep in the fridge until ready to serve. I want all the bites. Good thing we’re going strawberry picking on Sunday because We’re gonna need to make this! Thanks! so jealous, i want to go strawberry picking! This is ridiculously beautiful and I think would be SUPER impressive for ANY party/brunch! Totally summer on a plate!! Holy gorgeousness! And I think Eddie and Max will totally make an other one … Eddie will take care of the tart i’m sure, and for Max – pssshhh … the strawberries will be a breeze ;). Happy Mothers Day Jess, you and Eddie seem to be amazing parents! Only 5 ingredients?! My husband should swing for the fences on this one! Happy Mother’s Day! totally understandable! ;) thanks tonya! This is so pretty! It makes my eyes happy! That is too beautiful to eat! I’m more of a raspberry-blackberry girl, so I’d definitely switch the fruit. But like you said, it’s versatile and you can easily switch it up! Been a while since I saw such a picturesque recipe! Beautiful! Jessica this is absolutely STUNNING!! I’m just swooning. I never would’ve guessed there were only 5 ingredients..it’s so beautiful and perfect! I have yet to make roses out of avocado and strawberries and I’ve seen mango too on insta and a couple others. This is definitely going to force me to try. Also, I need that tart pan. Thank god I have Amazon prime! amazon prime is my liiiiife. Stunning! The strawberries really pop against the simple tart! Those roses!! This is such a beautiful tart!! i wish i could make that emoji on my computer! I can’t get over how pretty this is Jessica!! :D :D :D Talk about a work of art! This is seriously stunning Jessica! I hope Eddie can make it because you should be relaxing all. day. long. on Sunday. Have a wonderful Mother’s Day! right?! i’m an oreo crust freak! Did you know your are hysterical?! Like make me internally lol each post funny??? I’m pretty sure that’s why you’ve gained such a tremendous following despite all the competition out there. Thanks for the laughs! I think I will try making these strawberry roses instead of crawling in a hole … Hehe. thank you! this is so kind and really means a lot to me! Wow! I’ve been following your blog for several years and I think this is your most beautiful dessert yet! Great photography, also. I love the simplicity of ingredients! You had me at mascarpone! Beautiful dish. Can’t wait to eat this tomorrow. Make that today! I want this now! This is so so pretty! Just in time for Mother’s Day! 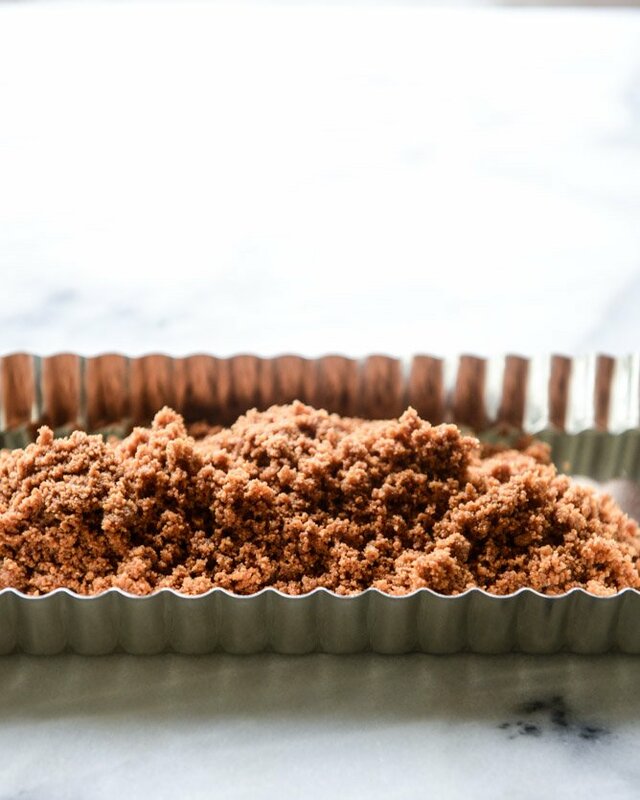 Stupid question… 1.5 cups of cookie crumbs, correct? Meaning, crush up enough cookies to give you 1.5 cups of crumbs. Not 1.5 cups of cookies and then crush. Anyone can answer me. I always get “crumbs” mixed up and end up with way to many or far too few. I’m not sure if I have the patience of a 97 yr old mom of 10 but those strawberries really make the dish! OMG! What a beauty! I really stared at the photo, great plating skills, and photography on the spot! And mascrpone is really creamy, and better than some american cream cheese, I think it’s the real deal! and i love all the ingredients, it’s a must try! I made this today for a Mother day dessert and it was just delish!! I just sliced the strawberries (no fancy knife work over here), and sprinkled a few blueberries over top as well. Honestly such a simple and yummy recipe; I will make this again, and try out different fruit combos! I made this on Sunday and it was a HUGE hit with the moms. Everyone was extra impressed with the fancy roses. :) Thank you!! OhMYGOD, this is craaaaaaazzy good!! I halved the recipe yet kept the same amount of powdered sugar in the filling (YEEESS) and made two small tarts. It tasted like the Oreo filling on a Biscoff crust! I am going to make this for every single brunch from now until the end of time. So so so good! This looks wonderful. Your recipes make this novice look like talented –thank you! I would love to serve it at a bridal shower. Can someone help me with tips on how to remove the tart from the rectangular pan. Hi Jessica! I think this would be beautiful for Christmas (here in Southern Ca!). Do you think I could make the crust a day ahead or do you think it has to be a same day kind of thing? Thank you! !